Try our take on PB and chocolate in this Peanut Butter-Chocolate Trifle! 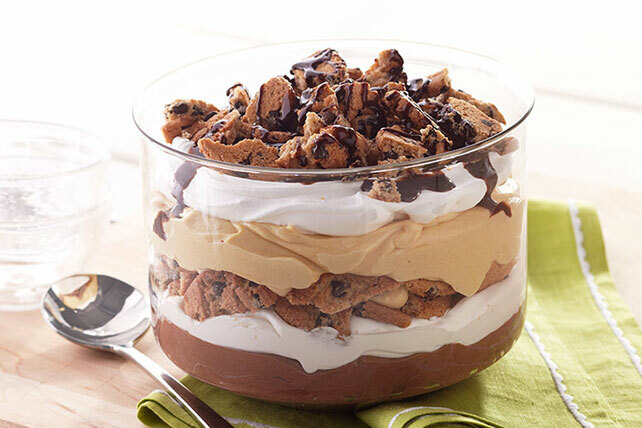 There's nothing trifling about this tasty Peanut Butter-Chocolate Trifle dessert. Empty pudding mixes into separate medium bowls. Add 1-1/2 cups milk to each; beat with whisk 2 min. Add peanut butter to vanilla pudding; beat until well blended. Stir 1/2 cup COOL WHIP into pudding in each bowl. Spoon chocolate pudding mixture into 2-qt. serving bowl; cover with layers of half each of the remaining COOL WHIP and chopped cookies. Repeat layers, using vanilla pudding mixture. Top chocolate pudding layer with 2 sliced bananas before covering with remaining layers as directed. Prepare trifle as directed but do not top with syrup. Refrigerate up to 6 hours. Drizzle with syrup just before serving.